Good morning and welcome to Varengold’s Daily FX Report. The Fed didn’t surprise the FOREX market yesterday and left its key interest rate at 25bps. The market still spends more attention to the economic data of the U.S. and is waiting especially for the leading indicators today. The USD extended its winning streak and climbed to a three-month high against the EUR as signals that the U.S. economic will recover with a faster pace increased the demand for the USD. Thus the USD strengthened versus 15 of its 16 major counterparts on concern that the U.S. initial jobless claims slowed and the outlook for the world’s largest economy improved for the eighth month. The Federal Reserve said yesterday after its decision to leave the key interest rate constantly that the economy is strengthening and the most special liquidity facilities will expire on Feb. 1, 2010. Standard & Poor’s followed Fitch Ratings and downgraded Greece credit rating to BBB+. The EUR/USD fell during the Asia session below the 1.4400 level and the GBP/USD also weakened to 1.6241 from yesterday’s closing at 1.6334. 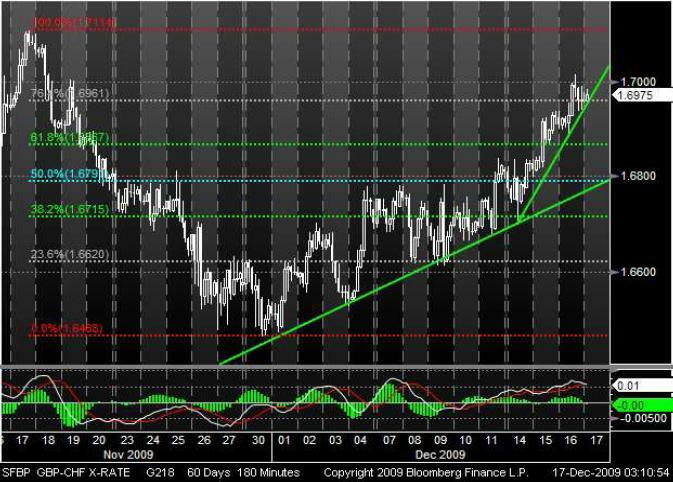 AUD/USD declined to the lowest level within the last six weeks as investors pared bets that the central bank will raise interest rates, after the central bank Governor denoted the temporary end of rate hikes. 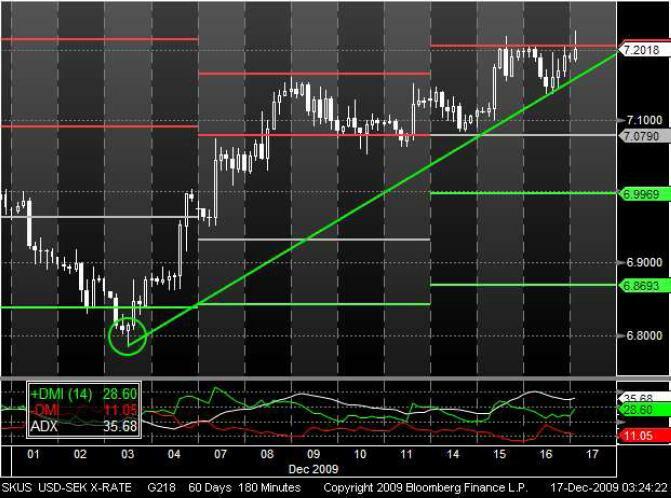 Having the GBP/CHF traded in a bearish environment since the middle of November it recovered assisted by a bullish trend-line and after it broke through the 50% Fibonacci retracement line the bulls boosted its trend once again. Now it remains to be seen if the GBP could sustainable cross its next resistance located at 76.4%. But the declining MA Oscillator may indicate for some profit takings. A long roving Doji heralded a trend-reversal and the USD bulls entered the market at the beginning of December. During that time the USD/SEK has been trading close to a bullish trend-line and touched for several times its first resistance pivot point this week. The DMI indicator showed a continuing bullish USD trend at least and may assist to cross the resistance at 7.2066.